A dog owner has been left devastated after her beloved pooch died from eating chocolate brownies. 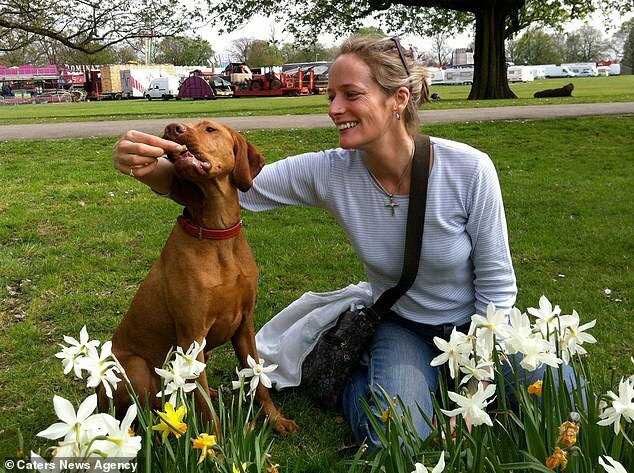 Ruby the Hungarian Vizsla stole two brownies her owner Kate Chacksfield made with a natural sweetener called Xylitol. 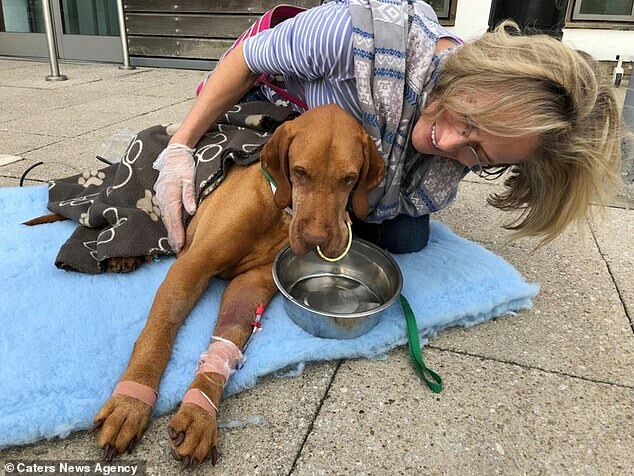 Three days later she started being violently sick and was rushed to the vets where she was diagnosed with liver failure and put on life support. She died eight days after falling ill at the age of seven, despite Ms Chacksfield, of Acton, west London, spending £10,000 on treatment in a bid to save her. 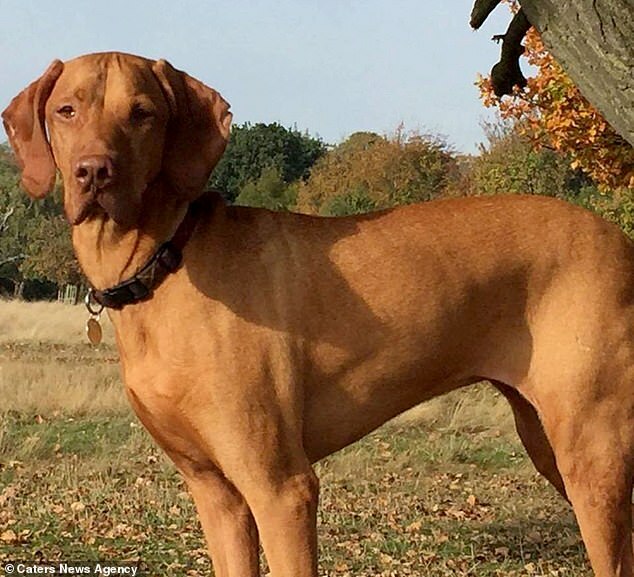 It was only after Ruby’s death that the 51-year-old realised the sweetener had made her ill – after vets pointed out it is toxic to dogs. Ms Chacksfield now wants to warn other dog owners of the deadly consequences of natural sweeteners. She said: ‘I only made brownies with Xylitol in to reduce the amount of sugar I was eating. Ms Chacksfield claims Ruby had stolen the chocolate brownies in the past and that vets had told her small amounts of chocolate aren’t too harmful to dogs her size. 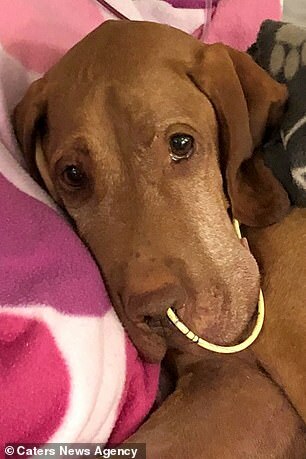 So she thought nothing of her nabbing the brownies until she fell ill.
She continued: ‘Ruby began being violently sick so I rushed her to the vets so sent her home after checking her over. 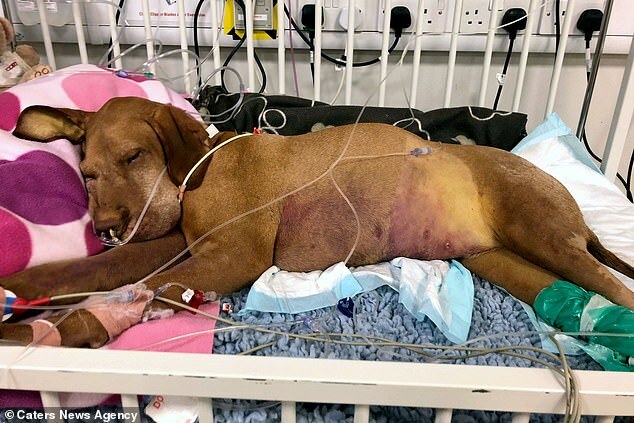 As Ruby’s condition began to deteriorate, she was taken to The Royal Veterinary College, London, but sadly died eight days later of liver failure and a suspected stroke. Xylitol is a naturally-occurring sweetener found in most plants and particularly fruit and vegetables. It is a sugar alcohol and is used as a sugar replacement, as it is sweet but causes less tooth decay. Xylitol is also used as a medicine to prevent conditions like ear and nose infections, as well as being offered as a sugar substitute for diabetes patients. It is often found in chewing gum and other oral products, alongside claims it reduces tooth decay and dry mouth. It can be deadly to dogs. If consumed in amounts greater than 100mg per kilogram of body weight it can cause dangerously low blood sugar, liver failure, seizures and strokes. These side effects can occur as little as 30 minutes after consumption. It is not toxic to humans but in large quantities can cause gastro-related discomfort. Ms Chacksfield says it takes just a quarter of a teaspoon to cause liver failure in dogs the size of a Labrador, and even less in smaller breeds. She added: ‘We did everything we could to save Ruby – she was so loved and we all miss her dearly. ‘We really had hope she would pull through so we were heartbroken when she didn’t. What foods are poisonous to dogs? The onion family, whether dry, raw or cooked, is particularly toxic to dogs and can cause gastrointestinal irritation and red blood cell damage. Signs of illness are not always immediate and can occur up to a few days later. However enticing chocolate is for humans and dogs alike, chocolate is a poisonous food for dogs. Chocolate contains a stimulant called theobromine (dark chocolate has the highest content of this) which is toxic to dogs and can cause kidney failure. Macadamia nuts contain a toxin that can affect your dog’s muscles and nervous system resulting in weakness, swollen limbs and panting. Corn on the cob could potentially be fatal if eaten by your dog. Although the corn is digested by dogs, the cob can cause a blockage in your dog’s intestine. Avocados are another poisonous food for dogs. Avocado plants contain a substance called Persin which is in its leaves, fruit and seed and can cause vomiting and diarrhoea in dogs. Our desire for sweet treats, chewing gum and drinks together with low-fat, diet and sugar-free products (including some peanut butters so always check the label before using this as a treat) are often laced with an artificial sweetener called Xylitol which causes an insulin release in our bodies. However, if your dog digests one of these sweetened foods they can go into hypoglycaemia which is linked to liver failure and blood clotting disorders. Alcohol has a huge impact on dogs even in small doses. The drink not only causes intoxication as it does in humans, but it can lead to sickness, diarrhoea and even central nervous system damage. Giving your dog a raw uncooked bone to chew on is great, but avoid cooked bones at all cost. These can easily splinter and in large quantities cause constipation or at worst, a perforation of the gut which can be fatal. Raisins are in many of the foods that we love to eat such as cakes, biscuits and cereals so it’s not just the fruit form we should be concerned with. The active ingredient which causes the toxin is unknown, however both grapes and raisins may cause severe liver damage and kidney failure. What should you do if your dog has consumed something poisonous? If consumed, even small amounts of these items can be fatal so always act immediately and take your dog to the vets.